Flight Design USA (FDPC) roster boasts a network of flight schools using Flight Design Light-Sport Aircraft. It is one of the largest LSA flight center programs in the country. 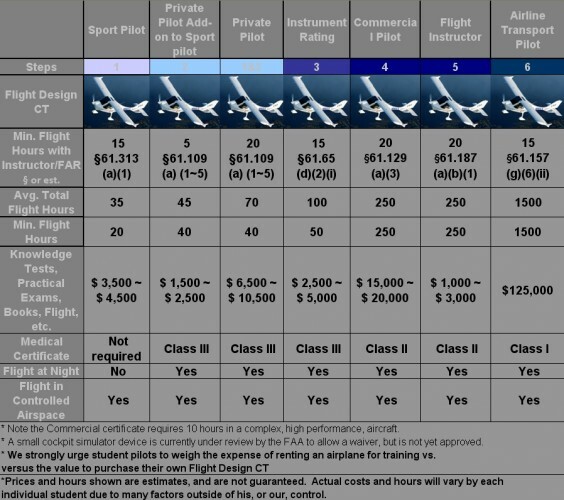 We have schools that specialize in LSA and focus on Flight Design. Schools are now recognizing that modern design, highly desirable moving maps, great company reputation and nimble handling characteristics of aircraft like CTLS, allow schools to attract and keep new students. We offer schools a state-of-the-art design with glass cockpits and modern safety features, low operation costs, but perhaps most importantly, an aircraft that impresses younger students. Many busy flight schools are able to attract customers from local areas and bring in additional pilots from out of the country. A superbly-equipped CTLS burns less than 4 gph, and offers more cockpit room with greater visibility than most of the other aircraft flight schools are currently using. The all-carbon-fiber CTLS comes with an all-glass cockpit, a cabin 10 inches wider than a Cessna 172 with huge visibility, a full airframe parachute system, and other features like three-axis trim all as standard equipment. We also have training partners Gleim and Jeppesen for Sport Pilot study and written testing. A student that drives up to an FBO in a modern car gets excited by our CTLS, especially compared to a flight line full of 30 year-old rather noisy aircraft with dated interiors, old-fashioned instruments, and faded paint.